Father Aleksey Glagolev was an Orthodox priest in the Pokrov Church in the Podol (today Podil) neighborhood of Kiev. His father, Professor Aleksandr Glagolev, taught Jewish Studies at the seminary in Kiev, and was known for having spoken in defense of Menachem Mendel Beilis during a blood libel case in 1911-1913. In early October 1941 Glagolev’s sister-in-law asked him to help Izabella Mirkina, her brother’s Jewish wife. At first, Father Glagolev’s wife Tatyana gave Mirkina her identity card and baptism certificate so that she could leave Kiev, but a month later she returned and the Glagolevs hid her even though they had two teenage children and a baby daughter of their own. "That night my wife and I didn’t sleep," Father Glagolev later recalled. “Tormented, we searched for a way to save her. What kind of Christians would we be if we refused this poor woman, who was reaching out to us and pleading for help?” Several months later, Mirkina’s daughter Irina joined her mother in hiding in the Glagolevs’ home. Glagolev also helped Tatyana Sheveleva, a Jewish woman married to a Ukrainian, and her mother Yevgeniya by providing them with baptism certificates made out in Ukrainian names, and allowing them to live in one of the buildings on the grounds of the church. 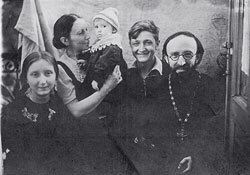 On September 12, 1991, Yad Vashem recognized Aleksey and Tatyana Glagolev, and their daughter, Magdalina (Maria) Palyan, as Righteous Among the Nations. On October 8, 2000, Yad Vashem recognized Nikolay Glagolev as Righteous Among the Nations.